Add a simply stylish edge to your look with this chic men's watch from Rotary. 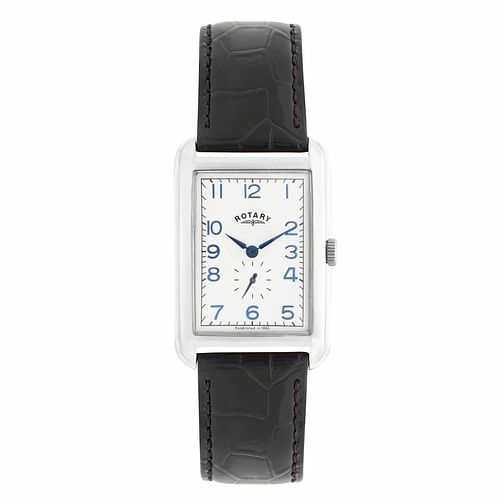 Featuring a white rectangular dial with colourful blue hour indexes set within a rectangular stainless steel case, this classic and versatile watch is finished with a black leather strap. The perfect mix of classic styles and contemporary details. Rotary Men's Portland Black Leather Strap Watch is rated 5.0 out of 5 by 3. Rated 5 out of 5 by Anonymous from Understated stylish watch This watch looks better in the flesh than the pics. On first impression it's understated and beautifully proportioned unlike so many of the huge watches these days. And when the light catches the face you get the glint of blue on the numerals and hands, adding something special. Rated 5 out of 5 by Anonymous from Great watch It looks way more expensive than it is, and the tank style is the perfect size.